Sanguine et Purpure: We don't need those wimpy bicycles! We don't need those wimpy bicycles! Running. In November. In Montana. Now THAT is dedication! I bet you thought the SigEp bicycle story was impressive. Check this one out. 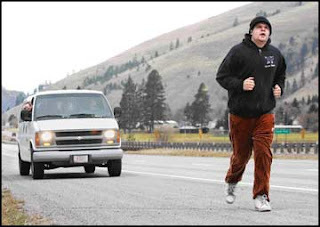 Jogging past the Clark Fork River, Nick Ferrington picks up the third leg of Sigma Phi Epsilon's every-other-year charity relay run from Missoula to Bozeman for the Griz-Cat football game. The event raises money for the Watson Children's Shelter. Every other year, when the Brawl of the Wild takes place in Bozeman, the guys from Sigma Phi Epsilon arrange a road trip. They get a couple of vans together, stock them full of food and beverages and hit the road. They take their time getting there, sort of the long way. Oh sure, it's the same way that any number of Griz fans take, that 217 miles of Interstate 90 heading east. But while you're listening to tunes in the comfort of your heated, padded four-wheel cradle of vehicular luxury, the Sigma Phi's are getting snowed on, rained on, honked at and blistered as they run - run, as in, with their feet - the entire distance from Missoula to that other town whose university has some sort of feline-like creature for a mascot. Neither rain nor sleet nor snow nor dark of night - and yes, they do run through the night - will stop these guys (and a few sorority women as well) from reaching the stadium by game time Saturday. And when they return (by car; are you bonkers? ), there will be no trophies or accolades. Just a pile of cash for Missoula's Watson Children's Shelter, for which their lungs and legs pump. For at least 20 years - and some say as many as 30 - the boys of Sigma Phi have done this for the center, which houses children who have been abandoned, neglected or abused, serving as an emergency shelter for infants to 14-year-olds. If it weren't for a good cause I would say these people are crazy. At least they have a great attitude. “In the past, police cars have stopped us because someone will report there's been an incident of spousal abuse and someone's running in front of the car,” said Colin Boyle. When they learn it's a group of fraternity guys doing the running, many assume that it's a hazing ritual. Because November in Montana can be ... well, it can be all wintry. “We run through it,” said Mahoney. “Wear a flannel shirt,” said Boyle. You can make a great case for it as a "Sound Body" activity, but you have to wonder what happened to the "Sound Mind" part.